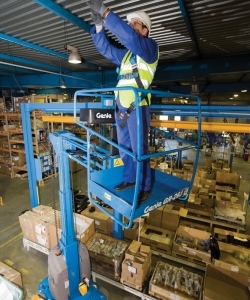 The Genie GR20J and GR26J vertical mast lifts are from the Genie Runabout product line with a jib providing 140° range of motion. Driveable at full height even in congested areas, thanks to its narrow footprint. Ideal vertical mast booms for locations where superior outreach in confined spaces is required, e.g. corridors and hallways. 2 people can work and drive at heights of up to 7.7m, with outreach of 2.75m. Hydraulic turntable rotation. 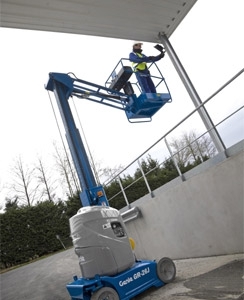 Up to 9.85m of driveable working height and 2.65m of outreach at an up and over clearance of 6.70m.